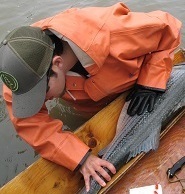 Striped bass recreational fishing has begun in the tidal Hudson River. These fish spend most of their time in coastal waters but return to the fresh water of the Hudson each spring to spawn. The Hudson River acts as a nursery for the newly hatched young-of-year bass. Striped bass commonly reach lengths of more than three feet and weights exceeding 30 pounds. 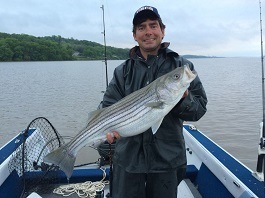 For people who fish the Hudson for sport, the striper is a favorite catch. Before you head out, enroll in the annual non-fee Recreational Marine Fishing Registry, and read a summary of Tidal Hudson River Regulations. Striped bass are cooperatively managed along the Atlantic coast by the Atlantic States Marine Fisheries Commission. Along with other states, New York has required regulatory measures that include monitoring programs, recreational and commercial minimum size limits, recreational creel limits, and commercial quotas to manage and evaluate the condition of the striped bass stock. DEC's monitoring program began in 1985. From April to June, Hudson River fisheries crew use a 500-foot haul seine, as well as an electrofishing boat to catch spawning striped bass. Biologists measure, weigh, and collect scale samples from the fish for aging before tagging and returning them to the river. In 2015, New York was required to reduce harvest due to a decline in the coastal spawning stock. In the Hudson River, DEC implemented a slot limit to protect most female fish, while allowing anglers the opportunity to harvest a trophy fish. These regulations ensure that striped bass will be plentiful for years to come. If you fish for striped bass in the Hudson River, you can share your fishing trip information and help DEC biologists understand and manage New York's striped bass fishery. Here’s how it works: Fill out a logbook provided by us whenever you fish on the Hudson River (by boat or shore). Record general location, time, gear used, what you caught (or if you didn’t catch anything) and return the logbook when you are done fishing. You’ll receive an annual newsletter summarizing the information in addition to the latest news regarding regulations and the river. Whether you catch-and-release or take home a keeper, you can be part of the Cooperative Angler Program. Join today by contacting Jessica Best 845-256-3009 jessica.best.